I just returned from a two-week vacation. I had great intentions to work on my blog while I was away, but I got distracted and couldn’t do as much as I hoped. Despite this, my mailing list continued to grow while I was away. When I checked this morning, I discovered that I gained 3610 new subscribers while I was camping without running water or reliable Internet. This totally rocks! And you can grow your mailing list like this, too! Before I get into the HOW of growing a mailing list, let’s talk about the WHY. Because if you’re anything like me when I first started blogging, I just didn’t see the value of a mailing list. I thought it was an old-fashioned idea and everyone was just so OVER email. 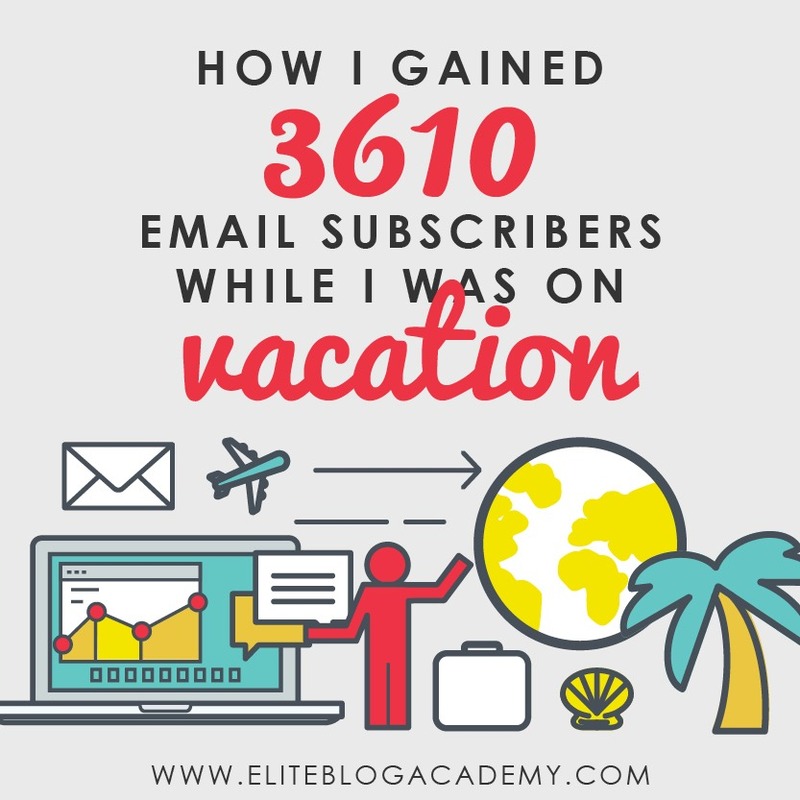 Thankfully, I enrolled in Elite Blog Academy not long after starting my blog and really listened when Ruth told me to grow my mailing list. I put a huge effort into growing it, getting to 10,000 subscribers in six months. That mailing list is what propelled me into a full-time blog income, bringing in $15k in revenue during my 11th month of blogging. I’m now at almost 60,000 mailing list subscribers and I’m not even at my second year blog birthday yet. Thanks to this list, I regularly make at least $20k per month, with some months as high as $45k. And because my mailing list continues to grow and strengthen, and I know I have the ability to reach my readers whenever I wish, I don’t stress about my pageviews and algorithms. Those 3610 new subscribers I gained while I was on vacation didn’t happen because some post went viral — in fact, my page views were down a bit because I wasn’t particularly active in promoting my freebies. If anything, I still feel I have huge potential untapped with my mailing list, simply because I really just haven’t been blogging all that long and I have so many more things to try and do! So what’s my secret to growing a great mailing list? I think it’s a fundamental difference in how I think about my blog and my list. Instead of thinking about my mailing list as just one more thing I think I should do for my blog, I have made my mailing list my main priority. I really use my blog as a means to attract people to my list. I make my list my first thought rather than an afterthought. This seems to make a huge difference! Stop chasing page views and social media followers and start paying attention to mailing list subscribers. I’ve made this my main metric beyond income. I check my subscriber count on a regular basis because if my typical signup rate drops, that alerts me to issues. Nearly everything I do on my blog or on social media is designed to either build my mailing list or nurture it in some way. How does this translate into everyday blogging? Instead of just coming up with good blog post topics, I come up with awesome freebies that I can make and blog about. I do this to attract NEW subscribers. Instead of blogging about whatever interests me or the latest trends, I blog about what my mailing list subscribers want to read and learn more about. I do this to keep the subscribers I have (but I also end up attracting new subscribers, too). It may shock you to learn that I give away many things for free that I could charge for (and have people actually purchase). This was a very mindful decision on my part early into my blogging career. Up to the point, I began my blog, I had been selling things on a separate and unrelated website for many years and I just felt burned out on the whole “shop” mentality. So I decided to make things that were good enough to sell but give them away instead. Why? Initially, I made these things to attract people to my blog, but after starting Elite Blog Academy, I switched to making them attract people to my mailing list. When you offer something of genuine value that your reader truly desires, they will WANT to be on your mailing list if for nothing more than the chance to get more of the same. Ask yourself this: “Is my freebie good enough that I could sell it and have people actually buy it?” If not, improve it. I actually ran tests of some of my freebies by offering them on Etsy to see if they were appealing enough to purchase. This helped me refine them a bit and learn more about what people wanted and were willing to pay for. Armed with this knowledge and the confidence that my items were good enough to sell, I then offered them to my readers for free. It was a slam dunk. Some people have asked if I couldn’t earn even more if I simply sold these things rather than give them away. I don’t think I could. Based on how much I earn from my list, those freebies would have to sell for a LOT more than current market value and be purchased by MANY more people to be worth as much to me. And how would I drive people to my shop without a great mailing list in the first place? No, I think the real value of my freebies is in their power to attract readers and convert them into subscribers. Want some real numbers? Let’s say I’d decided to sell my freebies instead. I could probably get $1-$3 from each one. Some would be more popular than others. And without a growing mailing list, I’d be hard-pressed to market them—I would be limited to my blog, Pinterest, Facebook (my own pages and groups, because other groups don’t want you selling files), Etsy, and my meager mailing list. I figure I could sell a few files each day, but let’s be generous and say I can sell 10 files a day at about a $2 average price. Hence, $20 a day. That number would be way lower (or non-existent) in the beginning, but probably a little higher toward the end of the year. So we’ll again be generous and say I can make an average of $30 a day. (Note that I am not just guessing here—I performed an experiment on one of my popular freebies.) So $30 x 365 = $10,950. That’s not bad, eh? Now, I don’t think I’d really have made that much, but we’ll just go with this for now. Now let’s compare that to what I’ve made during this same time frame because of my excellent mailing list. These numbers are from my first year of blogging. I’m making considerably more from my mailing list now, and expect that to only grow as I move forward. Knowing the realities of shops and selling products (I have 20 years of experience at that), I know any shop I had is very unlikely to grow on its own in the same way. Just because you’re offering something for free doesn’t mean you shouldn’t promote the heck out of it. Just making something awesome isn’t enough — people need to KNOW about it! Promoting your freebies means more people will find them and hopefully, those people will convert into subscribers. I use Facebook groups and Pinterest to promote my freebies. Sharing an attractive photo of the freebie itself, or of the solution the freebie is offering, works the best for me! In many ways, these three tips are the opposite of the typical shop owner’s mentality where you offer a thing for money, hope people come to your store and buy it, and maybe ask them to join your mailing list at checkout. I turn this around by offering a valuable thing for free, promoting that free thing as if I were going to make real money on it, and doing it all with the purpose of converting readers to subscribers. I realize now that my initial aversion to “selling things” on my blog prompted this reverse thinking… and it totally works! I start from a place of generosity and abundance toward others, and everything flows from there. I challenge you to change the way you think about your mailing list and try these tips too! This guest post was contributed by Jennifer Maker. Jennifer is a DIY & craft blogger at JenniferMaker.com, where she inspires women to handcraft a home they love. Jennifer also enjoys sharing what she’s learned about successful blogging with others through her courses at the JenniferMaker Academy. Connect with Jennifer at her Facebook group and get access to Jennifer’s free e-book, “LIST LOVE: Introduction to List Building,” here. Do you mind me asking where you promote your freebies? The question you asked already answered in the post. That is, facebook groups and Pinterest. I’m curious about the mechanics and the specifics. What specifically are you giving away, how do you transfer that free item (if it’s a material thing) and how do you convert that transfer into a email list signup, and how do you do that without being scammy? Love the idea, and it aligns nicely with the model of giving away free digital workbooks, plans, etc. in exchange for an email address. Thank you for sharing your story and congratulations on your success!